More and more people from the US, Canada, and the UK are choosing to get teeth implants in New Delhi, the national capital of India. Teeth implants in India cost a fraction of the prices charged in North America and West Europe. Dental tourism has gained considerable popularity because people want low cost yet high quality treatments and for this they do not mind traveling to distant lands. “Dental tourism in India” has become a buzzword, thanks to the mushrooming of numerous state-of-the-art hospitals and clinics across the country that provide easy-on-the-pocket treatments. A tooth implant is a fine metal rod that is placed in the jaw to act as a replacement for a real tooth root. 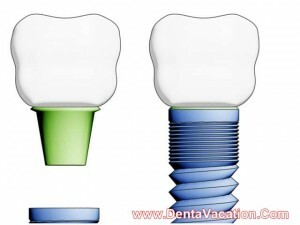 A dental implant is similar to an actual tooth root and is firmly placed within the bone. Teeth implants offer a sturdy foundation for the crowns that are made to match with the patient’s natural teeth. The metal rod is made of titanium and rarely rejected by the human body. The implants mesh with the actual jaw bone and form a secure foundation for the replaced teeth. As per clinical trials conducted by Esposito M, Grusovin MG, et al of the University of Manchester, UK, the results of which were published in the November-December 2007 edition of the International Journal of Oral and Maxillofacial Implants, dental implants have a success rate of nearly 95 percent. Teeth implants are secure and do not have the possibility to move around like removable dentures. As mentioned earlier, teeth implants in New Delhi cost significantly lower than in the first world nations. The low cost of Zimmer, ClearChoice, and Straumann teeth implants in India stems from the low cost of living in the country. Intense competition between the leading hospitals and clinics also helps in keeping a check on the prices of all on 6 and all on 4 implants in India. Low dental implants prices in Delhi are a boon for the under- and uninsured. One can enjoy savings to the tune of 75% by opting for dental implants in Delhi! 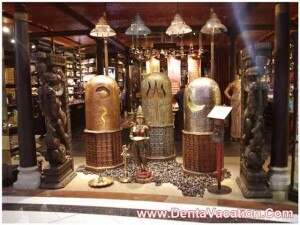 Why Get Teeth Implants in New Delhi, India? In addition to dental implant prices in Delhi being cheaper, there is barely any wait time, whatsoever for the procedure. The reputable dentists in Delhi are well-trained and qualified. Delhi is home to a number of state-of-the-art hospitals and clinics. The leading dental clinics in New Delhi use the most advanced equipment and follow globally accepted norms for treatment, hygiene, and aftercare. There are three JCI accredited hospitals in Delhi. Majority of the doctors and their staff are English-speaking. Barriers to effective communication are virtually absent. India’s busiest international airport is located in Delhi. The capital city is connected with Canada, the US and the UK through regular flights. Also, Delhi is a popular tourist destination and patients traveling to the city for cheap dental implants can turn their medical trip into a complete holiday! India Gate: This World War I memorial for Indian soldiers inspired by the Arc de Triomphe in Paris is a popular tourist attraction of the city. The Bahai Temple/Lotus Temple: In south New Delhi, this eye-catching temple, shaped like a lotus flower draws people of all faith from all over the world. Raj Ghat: This is the resting place for Mahatma Gandhi, the Father of the Nation. It is a must-see for dignitaries and tourists alike. Nearby attractions are the two museums dedicated to Mahatma Gandhi. Qutab Minar: A 237 foot high minaret, the Qutab Minar is a paragon of Islamic architecture in India. It is counted among the tallest minarets in the world. People are opting for teeth implants in Delhi, India instead of in their native land. The city offers quality dental treatments at prices which are considerably lower than in the West. Plus, one gets the chance of indulging in a rejuvenating vacation.